Previously, some time back the Japanese mobile blog site has flashed the news of the possible Samsung flip model android phones. It was probably the initial photos and glimpses that users got to see in a part with a press photo. But on the other day, the Chinese site official took it to announce their next flip model of Samsung. After a series of speculated rumours around which was creating a huge buzz in the mobile market, Samsung thought to call it a day. The model which is poised with code name of Hennessy is said to be targeted for retro users in the cosmos. The Samsung flip phones seemed to make their presence felt in a number rumours and leaked stages in the recent time. The very get up and the flip model designs give us a flash back of the devices that created in huge waves some time back. The officials of Samsung through their Chinese content site made their official land mark of the two screened flip phone to be setting their steps in Chinese market. This announcement was made on Wednesday and it was cleared that, there is no probable chance at present of the Hennessy sailing to UK or USA markets. The clamshell design of the mobile is relic of past, and is expected to be a blown out of memory for many. But, the thinkers of Samsung seemed to still eager to produce the models of flips based. This time around, the Samsung thinkers have made it a fusion of the past and the recent market in two. 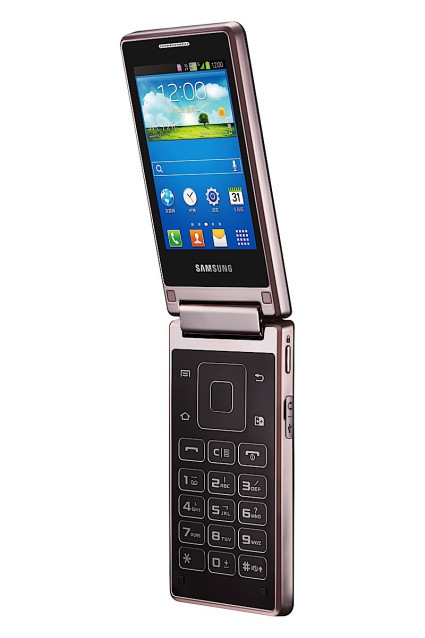 The Samsung Hennessy is a flip based, model which will come with Android operating system in it. The flip flop mobile devises are aimed for the Chinese markets primarily as before. Though reasons unknown, but the flip model designed by Samsung last year also was quite a smart sell. The Chinese market still has a good demand for the flip phones, which resulted in Samsung’s strategy to create a sequel of the last year’s smart phone. The latest unveiled model, Samsung’s Hennessy is actually a two sided display enabled device. The smart phone from Samsung has a screen of 3.3 inches and the resolutions stands at 320 x 480 pixels. The smart phone, Hennessy has 3 buttons for control in the rear front part of the device. On the hardware and storage limits the smart phone stands at a pretty good stage with processor strength of 1.2GHz and a RAM of 1 GB. The Hennessy also has a micro SD card enabled in it and comes with a 5 MP capacitive strength camera lenses. It is a significant move to target the end route of customers in China. The Chinese carriers can swipe off between the CDMA and GSM SIMS to use in the recent Samsung’s Hennessy at their will. Though this options is completely wiped out for the customers of UK and USA. The facility of two SIM compatibility will induce the customers in China to easily flaunt using the CDMA of UNICOM and China telecomm. At the same way they can simultaneously use the GSM SIM of China mobile as well. The smart phone from Samsung, Hennessy comes in with the basic android 4.1. The Hennessy also sports in the TouchWhiz technology flavours in it. The ChatOn from Samsung is in built in this particular smart phone from Samsung. Through the use of this signature application of Samsung on Hennessy one can send texts through cross platforms without any trouble of disruption. The app is quite a tough competitor to the whatsapp messenger tool which is quite popular in the social network communication. The news is also on, that the smart phone will also be able to feature the updated operating system of Android also. The Hennessy is quite a smart model. Though, there has been no plans to build in great success by the Samsung like S3 or the S4, it targets a certain area of users. The pricing is still not yet tagged of this model, so we have to tune in to watch for more developments on the Hennessy model of Samsung.